A.M. Easy 10, first 8 with Ted, in 1:18:48. Started out at slower than 10:00, then eased into 7:00 at the end with Ted, and then around 6:40 when running by myself. Legs felt a bit sore, but nothing exceptionally painful. Otherwise felt strong. P.M. Ran with the kids, total of 4.55 miles. First 2 with Benjamin in 16:29. Then 1.5 with Jenny in 14:22. Then 1.05 with Julia in 10:40. A.M. 6.05 with Adam and Ted in 52:25 at 5:20 AM, Ted was really hurting and so was Adam. Ted had two reasons to hurt, the marathon and the accident, and he decided to share with Adam, I guess, so Adam somehow ended up in pain as well. Picked it up to around 6:50 pace after dropping them off, ran another 4 in 27:18, total time for 10.05 was 1:19:43. Then ran 1.05 with Julia in 10:47. 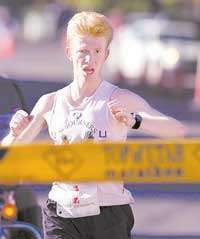 Odd how I feel very little pain, and yet I felt could not run any faster in the race even though I had every reason to. Kory and I are in the same boat this way, except he has a hard time in the first half, while I do in the second. However, one ray of hope for me - after running high mileage, and running hard after running easy for a long time on numerous occasions I held my own on the second half better than ever, and was able to negative split for the first time in my life. Of course, true negative split in St. George is when your second half is at least 3 minutes faster than your first. But in the past I could not even do as little as negative split it period even with the second half being naturally much faster than the first. So perhaps I am just a slow learner - many people can negative split in an optimal race off as little as 70 miles a week, while I may need to sustain 120+ for a while with lots of marathon bonk simulation runs before this starts happening for me. P.M. 1.5 with Jenny in 14:33, then 2 miles with Benjamin in 16:48. Still some residual soreness all over the legs, evenly spread, but not too bad, can start out at 7:00 pace without problems, can walk down the stairs, can run 10 miles at once and not feel like I've run at all. The virtual particle of dust that was there in my chest a week ago I guess never left, I think I just subconsciously ignored it to keep it from affecting the mental aspect of my race. I could feel it today and yesterday. Gave it some garlic treatment just in case. At 7:00 pace it is no more than an annoyance, at 5:20 pace I cannot feel it because there are a lot of other feelings that overshadow it, but it probably does make things harder by inhibiting the force of the air intake. Kind of like running at a higher elevation - you do not necessarily feel anything right away, but it is harder to run at the same pace. I would say 4.46 seconds per mile that the qualifier guy got me by could be exactly the size of that particle. Talk about Paul and his thorn in the flesh (see 2 Cor. 12:7). I guess all I need to do in three years is show up in St. George in no worse shape than this but without the virtual particle. Better yet, just come in better shape, so I can still run the qualifier even if I am not 100%. A.M. Easy run, total of 10. First 6 with Jeff and Adam in 47:55. Dropped them off, another 4 in 27:02. Total of 1:14:57 for 10 miles. P.M. 2 miles with Benjamin in 16:27, 1.05 with Julia in 10:58, and 1.5 with Jenny in 13:42. Considering jumping into St. Jude Marathon in Memphis, TN on December 1 - this would be a nice get-away trip for Sarah and I. Figured if we are going to do one, we may just as well try to get as much of it paid for by somebody. Wrote an e-mail to the race director to see what kind of perks they can give a 2:23 US guy. A.M. Ran 8 miles with Ted, James, Jeff, and Adam in 1:00:03. Their time was about 35 seconds slower because of my VPB stop. Ran 1:24 quarter to catch up, felt good. James pushed the pace today. I told him, now stick out your hand and tell your dad to give you five. James ran the last mile in 6:38 with the last quarter in 1:30. Afterwards, ran 2 more miles alone in 13:16, total time for 10 was 1:13:19. P.M. 1.05 with Julia in 10:56, then 2 miles with Benjamin and Jenny, Jenny ran 1.5 in 13:47, then Benjamin and I finished 2 miles in 17:53. A.M. 7 miles with James, Adam, and Ted in 54:12. Had a VPB stop, caught up with a 1:24 quarter. Also, we kicked a bit at the end, got 1:28 for the last quarter. Then ran 1.5 in 10:35, turned around and ran a mini-tempo back, 1.5 in 8:39. This was coming back from Geneva Road to the house, it is a slight net uphill, and a lot of going under bridges and back up, and a lot of turns as well. Nevertheless, the effort was too much for the pace, the legs felt flat. Probably the consequence of running a marathon on Saturday and getting a minor stomach flu yesterday - I did not eat dinner, was not hungry for it, and I do not think my lunch digested very well. Could also be the consequence of a two week taper + sickness. However, 1:24 quarter earlier felt good, I did not want to stop. On the 1.5 run, first quarter in 1:28 did not feel that good, another indicator of carbo-depletion, lower blood sugar towards the end of the run, so the brain is refusing to let the muscles go. Will do a control tempo 5 miler at marathon pace effort tomorrow to figure out how to train next week. P.M. 1.05 with Julia in 10:50. HR afterwards was 108. Yesterday we hiked to the Timpanogos Cave. I was carrying Joseph in a kid carrying backpack, and at the very end of the climb HR was 96. This goes to show the difference between walking and running for aerobic development. Even with the extra 35lb on my back, and walking up a 12% grade I could not get anywhere close to the effort of running a mile at 10:18 pace. Also ran 1.5 with Jenny in 14:21, and then took Benjamin and Jared (Ted's son) for a run. I told Jared if Benjamin dropped him without breaking 8:00, Jared would have to run 2 miles instead of 1. The drop was defined as the failure to give Benjamin a five in 10 seconds from the invitation. Jared did a great job on the fives closing significant gaps almost immediately. I think he has a decent amount of fast-twitch fibers. Either that, or he really did not want to run 2 miles. They ran one mile together in 8:47. Afterwards, I put Jared in the stroller, and Benjamin let his horses loose closing with the last mile in 7:12, the last quarter in 1:37, and nailing the 8:00 mile guy at the very end with 15:59 for 2 miles. A.M. Steve Ashbaker (the Dark Horse) joined me this morning. For some reason I woke up at around 3 AM, and just felt too excited about life to sleep. So I read the scriptures, then still could not fall asleep, so I worked some. Then I was able to fall asleep. Got up at 8, Steve was running a bit late, which was nice because I had slept in. During our warm-up we literally ran into the Domestic Violence Awareness 5 K - the crowd at the start of the race was blocking our path. They told us it was going to start in 2 minutes, Tom Lee was there, we decided to pace him. We went out at around 6:10 pace. After the first mile, the leaders looked temptingly close although they must have had about 40 seconds on us. The temptation was more than Steve could bear. He went after them like a young stallion released from a corral and running through a wide field. I figured I could finish pacing Tom, this would give him a faster time, and leave me more energy for our planned tempo run later. Tom did OK until around 3 K mark, then he started running out of steam. Probably a neurological issue, I've experienced the symptoms myself many times. He hung on to finish in a respectable 19:40 for this course which had a significant amount of turns and uphill, and no elevation drop. This gave him first place in the masters. Steve almost got the winner, but ran out of road finishing in 17:42, 12 seconds behind. He also ended up running some extra distance because of missing a 180 turn over by DI. Then we jogged to the start of the Provo River 5 Mile Tempo. The plan was to go at whatever pace, based on how we felt, somewhere in the area of marathon pace. For me, this would be a test of recovery from the marathon, and general fitness and health. If I could run sub-28:00 without busting my gut or a bit slower feeling like it is a jog, that would be good, I can start training more or less normally next week with 3 tempo days. If breaking 28:00 required a heroic effort, or I could not do it at all, then something is seriously wrong and I need to take it easy another week, get more sleep, eat more carbs, and more garlic. We went through the first mile in 5:38 trading quarters. Steve was feeling the effects of his stallion run in the 5 K earlier, on top of the fatigue of the marathon. He wanted to back off. I said, let's at least try to keep the 5:40 guy in check. We did the next mile in 5:40. Steve started to drop back a bit. Got 14:06 at 2.5, the pace felt very comfortable, good sign. Watching the 28:00/5:36 guy from behind like a vulture getting ready to strike. Steve stopped at 2.5, not feeling too good, but then he decided he did not want to run the remaining 2.5 slow as it started raining harder, so he just coasted through it at a milder tempo pace. Next quarter after the 180 turn was 1:26, oops, my lunch (the 28:00 guy) is running away, got to get him. Kicked into gear, decided to do the remainder of the run at threshold pace. Next quarter in 1:21, 5:35 mile. Next mile was 5:30, but the quarters gradually digressed to 1:22, and then down to 1:23. Not sure if this was fatigue from the marathon, the left over from the mini stomach flu on Thursday, or just the shoes getting heavier, the legs getting colder, and the puddles getting deeper from the rain. Now one second ahead of my lunch, but I do not get to eat it if he passes me back. Next uphill quarter in 1:25. Not good, the lunch has caught up. Next two quarters in 1:24, just trying to keep my lunch at bay, staying right with him. Picked it up on the last one, ran 1:20, 4 seconds ahead of lunch, total time 27:56, last mile 5:33. I think I passed the health/fitness test, OK to train with tempos next week. Ran 2 miles with Benjamin in 16:45. Jared ran the first one with us in 9:14. Then 1.05 with Julia in 10:01. Jenny ran with Sarah.